A Heart breakingly beautiful novel! A story about two sisters in Nazi occupied France, it is about family, friends and the choices we make. The author's writing is so vivid you could see, feel, smell, hear, she immerses you in the story. This is the best book I have ever read (my preferred genre is sci-fi/fantasy). The only thing I would warn about, make sure you have tissues available while reading this. In love we find out who we want to be. In war we find out who we are. 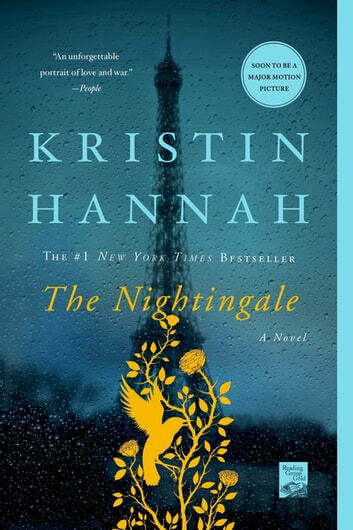 Kristin Hannah has done it again with The Nightingale with her poignantly written novel about two sisters that are living in France, that is occupied by Nazi's during World War Two. In War both sisters are faced with choices that do for the love of their family and friends, and heartbreak and hardship they endure before and after the war. It's a must read. Kristin Hannah is vivid in detail with rich characters, making it a novel that you don't want to put down. Youwon't be disappointed by this book. How to describe a book that is unforgettable; well unforgettable, but this book is also so much more. It is a heartbreaking, mesmerizing, haunting & uplifting tale. The story is a fictionalized account of a French family during WWII and its aftermath as told from the perspective of two very different sisters. It is a family that has already been affected by tragedy & the First World War. What happens when they become embroiled in Nazi occupied France? The story show us their struggles, their fears, their loves and the horrors of war & the lengths that a person will go to in order to survive. We learn that no one really knows everything about another person, even when that person is a loved one. Everyone has their own story to tell. Sometimes the book was one I couldn't put down. At other times I had to take a break from the story - not because I didn't find the book enthralling but because it was. It was too real, too sad and too scary; all at the same time. The writing is exceptional & the characters come to life on the page -- they will live on in my heart & memory for a long time. Not only does the author capture the horror of war but also the courage and bravery of anyone who tries to right a wrong or offer help. Resistance is frightening but also empowering & beautiful. This is an excellent book that I would highly recommend to anyone who enjoys historical fiction but also to anyone who wants to learn more about the human spirit. A beautifully written & a hauntingly poignant tale. Fabulous Read . . . In "The Nightingale", set in occupied France during World War II, the lives of two sisters are very different. The older sister must keep her home and young daughter safe while her husband is off fighting while the younger sister joins resistance forces to work against the Nazis. The author tells this story poignantly but the book is fast-paced, and I found it difficult to put down. For me, "The Nightingale" was one of the best books I've read in a very long time. Kristin Hannah has written an emotional, accurte and spellbinding novel. One of her best. A must read.